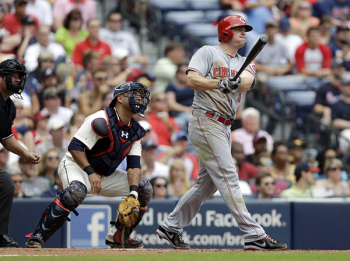 Jay Bruce hits his 19th home run off the Braves. After the way the Cincinnati Reds have been playing of late, it sure was nice to see them end the unofficial first half of the season with a win. The win over the Atlanta Braves also earned them a split in the series against one of the major’s best teams. It wasn’t always a sure thing, though. Tony Cingrani started and pitched fairly well, but his defense let him down and cost him the win. Thanks to Todd Frazier losing a pop-up in the sun in the second, Cingrani ended up throwing 24 more pitches to end the inning. What should’ve been the final out to the inning resulted in a run scoring and Cingrani blowing his pitch count. He was removed after the fourth. The bullpen held the lead. They allowed a few runs, but the lead was never in jeopardy. Speaking of, it sure was nice to see the offense create a lead and then add to it as the game continued. So often they’ve scored early and then never again. But not Sunday. After the fiasco with Frazier allowed the Braves the early lead in the second, the Reds came right back in the third. Joey Votto doubled in Cingrani, who’d reached on a bunt. Brandon Phillips grounded out, scoring Shin-Soo Choo. And then Jay Bruce brought Votto home with his 19th home run. Later in the game, Choo provided needed insurance runs with his 13th home run. Also, Phillips and Frazier each drove in runs in the 9th. All in all, it was a nice last game before the All Star break. Hopefully, the offense that showed up yesterday won’t get lost driving around during the break. It’d be nice to see that Reds team from May again. Posted in Cincinnati Reds, Game Wrap, NL Central.